Colorado is known for craft beer, with 10 percent of America’s craft breweries located within the Centennial State. There are more than 200 breweries in Colorado, so it truly is a challenge to narrow this down to just 10 of the best! At these high-quality craft breweries, every barrel of brew is special. No matter if you’re looking for a hoppy IPA, a sour wine-inspired beer or a hearty milk stout, there is definitely a beer in Colorado for you. Without further ado, here are the 10 best breweries in the state! New Belgium Brewing Company is one of the biggest in the state and has become one of the most well-known Colorado breweries in the nation. “Fat Tire” is a favorite of their selection! However, this brewery is home to plenty of delicious brews, especially their small batches that are sometimes exclusive to brewery patrons. New Belgium even throws together a beer and biking festival every year, called Tour de Fat, which is not only in Colorado but other U.S. cities. Left Hand’s popularity has grown due to its iconic and delicious milk stout, Milk Stout Nitro. However, if stout just isn’t your beer of choice, try the Sawtooth Ale here, which is a popular favorite. Head to Left Hand’s location in Longmont to enjoy the brewery’s incredible brews with a mountain view. If you aren’t located in Colorado however, Left Hand does sell beer in 26 different states. Oskar Blues Brewery isn’t just known for having incredible beers but also known for serving those beers in a can. Oskar Blues is the largest craft brewery to exclusively sell canned beer. Founded in 1997, this Longmont brewery has expanded to two other locations in the nation but will still always call Colorado home. Dale’s Pale Ale was the brewery’s first beer and remains its most popular brew. Great Divide Brewing Company has been brewing up great batches up beer since 1994. This brewery remains distinctly Denver with a five-acre campus in the city, just a mile away from the brewery’s earliest humble establishment. Great Divide has a taproom that has over 15 seasonal and year-round brews. This brewery has won numerous awards in the Great American Beer Festival and the World Beer Cup. One of Great Divide’s most popular brews is the Yeti Imperial Stout. This is the second Fort Collins brewery on the list. Odell Brewing Company, which started in 1989, is a beloved brewery that has grown in popularity since its opening. Odell now brews over 45,000 barrels of various beers that are sold in 11 states and in Great Britain and Ireland. There are so many delicious brews coming out of Odell. Definitely try 90 Shilling, 5 Barrel Pale Ale and Easy Street Wheat. Breckenridge Brewery started in Breckenridge in 1990 but needed to expand to a bigger brewhouse when business started getting good, so the brewery now operates in both Breckenridge and Littleton on a 12-acre campus. The tasting room at Breckenridge Brewery in Littleton is more than just a tasting room. Known as the Farm House, it has become a restaurant and a taproom. If you aren’t located in Colorado, you can still find Breckenridge Brewery brews in 35 states. Breckenridge Brewery’s most popular brew is definitely the Vanilla Porter. Phantom Canyon Brewing Company is one of the best breweries in Colorado Springs and the oldest established in 1993. 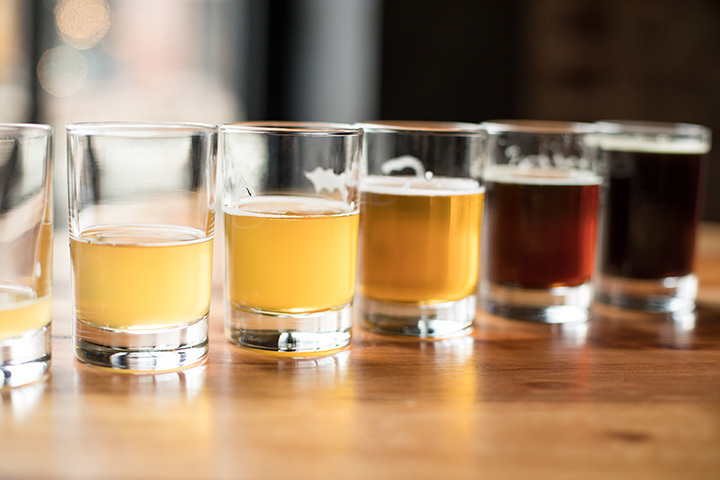 Offering more than 10 brews on tap, you’re sure to find something you enjoy at Phantom Canyon. Taste the Streamliner or the Two Headed Dog IPA, both of which are very popular beers at this Colorado Springs brewery. You don’t need to be in the Front Range of Colorado to make a great beer. Located in Durango, Ska Brewing was established in 1995 and is a 100 percent wind-powered facility. The brewery might be smaller than others on this list, but it still churns out some impressive brews. Their IPAs will make every IPA lover happy. Try the company’s popular brews, Steel Toe Stout or Buster Nut Brown Ale. Crooked Stave Artisans is a young brewery, established in 2011, but has created a cult following in Denver. The company has created some topnotch sour beers. If wine-focused, barrel-aged beers are more your style, you will love the brews coming out of Crooked Stave. Find Crooked Stave brews at an artisan food market in Denver known as The Source. View more Colorado Breweries and Brew Pubs.